The best work is done where you�re most comfortable. In order for students and staff to succeed, seat them at a comfortable Desk that helps make their job easier! Non-Traditional Desks, like Music Stands with Music Chairs and Vocational Arts Work Shop Tables will be sure to make your student successful in their specialty! Science Lab Instructor Workstations with Lab Stools give the perfect perch in a Science Lab Classroom. Study Carrels give students and researchers privacy in test taking centers and libraries for quiet study. Add a Circulation Table to that same library and you will be ready for Book Carts and Book Shelving in no time! More traditional School Desks, like Tablet Arm Desks and Chair Desks give just enough room for a student to work at and are perfect for smaller classrooms. Student Desks work well with Stacking Chairs that can be moved out of the way when doing group activities and presentations. 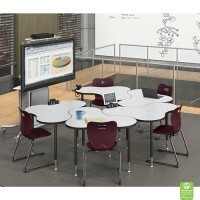 Teachers can watch from a more spacious Teacher Desk where all of the best lesson plan ideas can be stored. Choose the perfect Desk base to add your own flair and personality to! Make sure your teachers can sit comfortably at an Office Chair while they watch over students taking tests. Desks are also necessary in the office for efficiency on computers and other tasks. Spacious Desks that can double as Conference Tables and Training Tables fit together nicely, but can be divided by Desk Top Table Privacy Screens. Check out all of our Classroom Furniture, Whiteboards, and Office Furniture to begin creating the most efficient workspace for every age!